If you were hanging out in arcades in the early nineties, then you know they all had three things in common. Bright colors, amazing sounds, and an unmistakable air of 'coolness'. 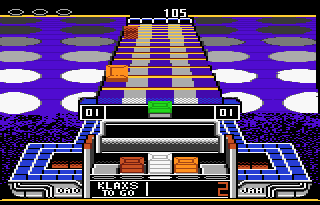 If any one game embodies the essence of the early 90's it's Klax. 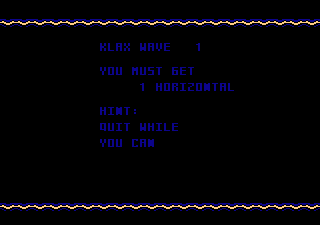 Not only was Klax a refreshingly original concept in an era of 'Me Too!' beat 'em up games, but it was also amazingly addictive. 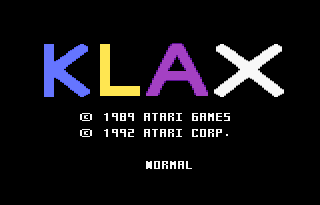 It was the nineties, and it was definitely time for Klax! 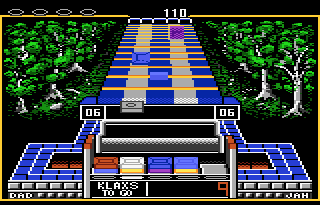 Klax is a puzzle game along the same lines as Dr. Mario and Columns. The concept is simple, as colored tiles come down the conveyer belt at the top of the screen you must catch them drop them into the bin below. 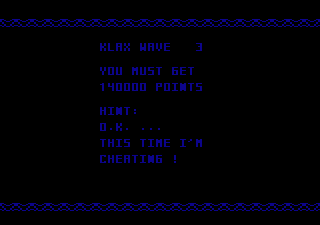 If you line up three tiles of the same color you score a "Klax" (hence the name of the game). Klaxes can be scored horizontally, vertically, or diagonally. Each type is worth a different amount of points. In addition to the simple Klaxes, there are advanced patterns that are worth more points and can even trigger hidden events! The paddle can only hold six tiles, after that they will begin to fall off. If you don't want a particular tile you can temporarily throw it back by pressing up, but eventually it will come back down the conveyer. Every time a tile falls off a miss counter lights up, when all your miss counters are lit up it's game over. To help you in your task, occasionally you will get a special glowing tile. These glowing tiles are a wild card and can be used for any color. Wild tiles are necessary to complete some of the more advanced patterns such as the Ultra Star and Tengen Stax. , but use them wisely as they are few and far between. For more information on these advanced patterns check out KlaxWorld.com. 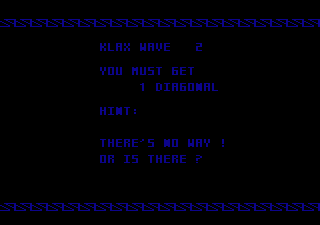 Of course Klax wouldn't be one of the greatest puzzle games of all time if didn't contain a few secrets. By completing the "Big X (a 5x5 X pattern) on certain waves, you can warp ahead to the higher levels. Completing the Big X is rather difficult as you must place the center tile last (otherwise you'll just score a diagonal), but is the secret to getting those amazingly high scores. 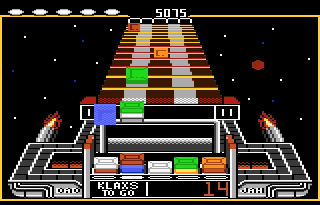 The 7800 version of Klax is unique as it contains three"Impossible" levels. These secret levels can be accessed after beating all 100 waves. All you have to do is get one simple horizontal, how hard can that be? Look, they even set you up with two like colored tiles! Just drop one in and you're golden. Unfortunately all you'll get on this level are rust colored tiles, no yellows or greens. Hmm... They also seem to have neglected to give you three empty spaces to make your own rust colored Klax. How about using the two rust colored tiles in column one and three by stacking four rust tiles in the second column? 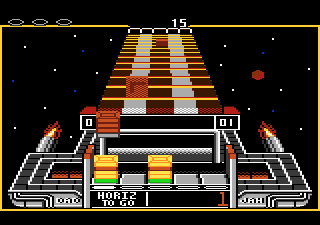 Wait a minute, dropping the 3rd tile scores a vertical Klax! How on earth do you get four in that column? If you thought the first impossible level was bad, then you're gonna freak when you see this one. Here you only have to get one diagonal, how hard can that be? Once again they've set you up with several tiles, just stack a few in the center column and you're done. Wait a minute, all the tiles on this level are wild tiles! How do we make a diagonal Klax without having a horizontal or a vertical Klax first? 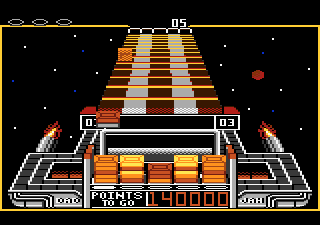 While the 7800 version Klax may be one of the best home versions out there, it was sadly never released. 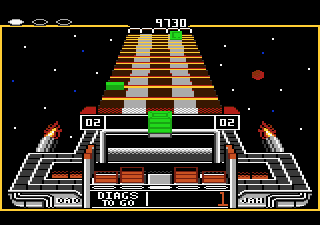 Around the time Klax was completed Atari decided to drop all support for the 7800, so many games that were completed or nearly so were shelved. Thankfully in 2002 Lee Krueger of ResQsoft (http://home.earthlink.net/~resqsoft/products.htm) was able to contact the programmer and obtain permission to sell reproductions to eager Atari 7800 enthusiasts But one has to ask, if it's now the 2000's, is there still time for Klax?